164 Hicks is a FURNISHED 3 Bedroom, 2 Bathroom Parlor and garden duplex available from 1-12 months. Amenities include a private Garden, wood-burning fireplace, a renovated open kitchen formal dining and living parlors and all furnishings including linens and tableware. The apartment features a laundry room exclusive to the apartment and exclusive use of the townhouse garden. 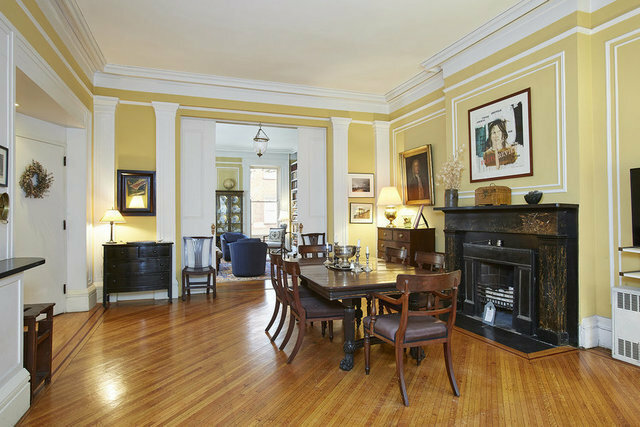 The entertaining parlors and master bedroom boast ceiling heights of almost 12 feet. The convenient location is close to the 2,3,4,5,R and A trains- making the commute to Manhattan quick and easy. The Brooklyn Heights Promenade, Pierrepont Playground, Montague Street with it's shops and restaurants and Brooklyn Bridge Park are all in the immediate vicinity. The apartment is perfect as a temporary home during your renovation or relocation. All utilities and cable are included. 164 Hicks Street is available furnished from 1 to 12 Months. Call broker for availability. A $200 per week cleaning fee is additional.